Pumpkins are low in calories, but are a rich source of dietary fiber, anti-oxidants, minerals, vitamins. Recommended by dieticians in cholesterol controlling and weight reduction program. Pumpkin is also a storehouse of many anti-oxidant vitamins such as vitamin-A, vitamin-C and vitamin-E.
Arugula is an excellent source of vitamins A and C, folic acid, calcium, manganese, and magnesium. It’s also a very good source of potassium, iron, zinc, riboflavin, and copper. Pumpkin seeds are a concentrated source of protein, as well as a good source of magnesium, zinc, and phytosteroids which help lower cholesterol. 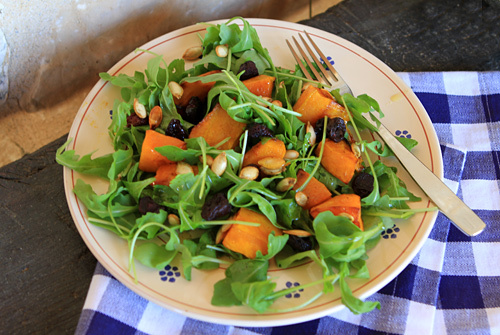 A perfect fall salad combining sweet roasted pumpkin and peppery greens.